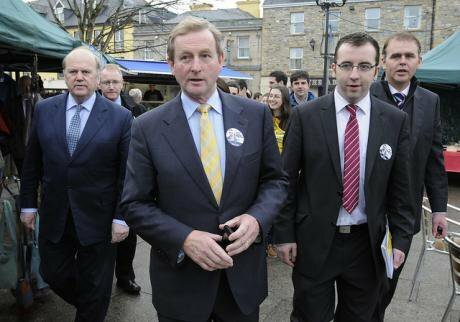 Irish PM Enda Kenny, along with Michael Noonan, Barry O'Neill and Joe McHugh. Flickr/Fine Gael. Some rights reserved. Ireland is not Greece. If government ministers and technocrats wore t-shirts, this slogan would be imprinted on those in charge of managing the crisis that hit Ireland in 2008. There is a certain irony here — when the Eurozone began to feel the first tremors of the banking earthquake, it was Ireland and its rogue banks that were feared most as the source of possible contagion. Over time, it suited the narrative of the European Commission, the European Central Bank and the International Monetary Fund to shift that stigma onto Greece. The Irish government has been only too happy to play along: Ireland’s image as the success story of bailouts and austerity is good for investment and good for access to international financial markets. But Syriza’s victory in the Greek elections poses a profound challenge to the Irish governing class — does it keep insisting that Ireland has no common cause to make with Syriza or does it acknowledge that Europe is divided between the creditors and the debtors and that Ireland is firmly in the latter camp? It is true, of course, that at many levels Ireland and Greece are not especially similar. Ireland entered the crisis with very low levels of public debt. The Irish economy has been much more deeply integrated into the global system — Ireland has survived the crash in part because of its close ties to the US and British economies where austerity has been limited. The Irish political system has deeper roots in caution and conservatism. Unemployment in Ireland, especially youth unemployment, has been somewhat limited by the relative ease with which Irish people can emigrate to English-speaking countries like Australia and Canada — a significant factor in reducing the scope for protest. While Irish systems of governance (regulation, corruption, tax collection) proved to be catastrophically bad, they were, for many reasons, easier to reform (at least on the surface) than their Greek equivalents. Yet these differences, important as they are, cannot obscure one overwhelming commonality of interest: debt. The four biggest public debtors in the Eurozone are Greece, Portugal, Italy and Ireland. The policy of socialising the liabilities of rogue private banks and the economic consequences of taking about 30 billion euro out of the economy in spending cuts and tax rises added about 160 billion to Irish public debt. At the end of 2014, the national debt was 203 billion euro — 111 per cent of GDP. (Since GDP is artificially inflated by the practices of Irish-based multinationals, even this somewhat understates the scale of the problem.) The servicing of this debt is a huge burden on a much-reduced exchequer. The total annual take in income tax for Ireland is around 18 billion euro. Interest on public debt takes around 8 billion of this. Debt service currently costs as much as the running of Ireland’s entire education system. As a percentage of GDP, Ireland’s debt service costs are actually higher than Greece’s. Why would the Irish government take such a line? In the short term, it is concerned to reassure financial markets that Ireland is the success story it is supposed to be. There is a certain logic in this: Irish 10-year bond interest rates were trading at under 1.1 per cent at the beginning of this week, while Greek 10-year bond interest rates are close to 9 per cent. There’s a strong financial incentive for Ireland to place as much distance between itself and Greece as it possibly can, all the more so because it is hoping to replace some of its expensive IMF loans with cheaper money raised on those international markets. But beyond this, there is a deeper terror — the fear that Syriza might actually succeed. The strategy adopted by both the governments that have been in office since 2008 has been one of strict obedience to the demands of its lenders. Everything has been sacrificed — up to and including national sovereignty during the so-called bailout by the Troika — in order to place Ireland as the Eurozone’s exemplary pupil. There has been a mutual interest at work here. Angela Merkel and the Eurozone leadership need a success story in order to prove that the dual policy of socialising private debt and imposing austerity is both legitimate and effective. The Irish government needs to be able to show its own electorate and international lenders that it is indeed a great success, that the imposition of so much private debt on citizens has made both moral and economic sense. Hence, Ireland does what it is told and gets in return the gold star for diligence, effort and perseverance. Just last week, the IMF’s Christine Lagarde told The Irish Times that Ireland has “set standards” for other indebted nations to follow — Greece was hardly far from her mind. If Syriza succeeds in getting major concessions on debt, this whole strategy will be exposed as folly. The Irish political and technocratic elite is deeply invested in an essentially religious narrative: Ireland sinned, Ireland confessed, Ireland did penance, Ireland has been forgiven, Ireland will be rewarded. But if Greece stops doing penance and is nonetheless rewarded, this begins to look like what it almost certainly is — a rather childish view of how power works in the world. There is thus a kind of quiet hysteria behind the insistence that the massive public debt that is Ireland’s legacy from the Eurozone crisis is “affordable and repayable”. Who is the debt “affordable” for? Not for the 400,000 children who are now living in deprivation in Ireland. (The rate of child poverty has doubled since 2008.) And how exactly is an economy with fewer than 2 million workers and massive levels of household debt going to repay 200 billion euro, especially if Eurozone deflation makes the debt even more extreme? The disjunction between the official insistence that everything is fine and the reality as experienced by most Irish citizens will make for a deeply divided response to Syriza. For the government to insist that Ireland has no stake in a comprehensive resolution to the European debt crisis may make it popular in Frankfurt, Brussels and Berlin but it will do little for its already battered popularity in Dublin and Cork. On the other hand, Syriza’s victory is a huge boost to the Irish opposition, especially to Sinn Fein, which has long placed itself as the Greek movement’s Irish ally. Most probably, the Irish government is hoping that it will get the best of both worlds. It will hold the orthodox line while at the same time Syriza wins some concessions that would then be passed on to Ireland as well. It may be far too clever a game to try to play at a time when Europe’s future is being contested and the pressure to pick sides will be hard to resist.